THE PICKIEST EATER IN THE WORLD: THE GUSTAVIAN "SPECIALS"
Nice Euro feel to it. I first heard of The Gustavian from one of my bosses. 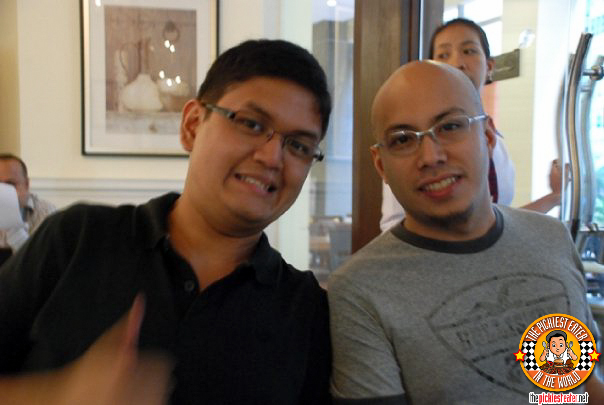 He heard me asking around what's a good place in Eastwood to eat at. He immediately chimed in about The Gustavian.. "Very good food, great deli selection, at an affordable price", was his comment. Of course it didn't sink into me back then, that what may be termed as "Affordable" to a boss, may not fall under the same category to said bosses' employee. Rina and I met up with my buddies Ted and Mark for dinner at Eastwood and my bosses' words, ""Very good food, great deli selection, at an affordable price" kept ringing in my head.. I was half expecting a ghost image of me to pop out behind me like a Safe Guard commercial saying the same words.. So it was inevitable. 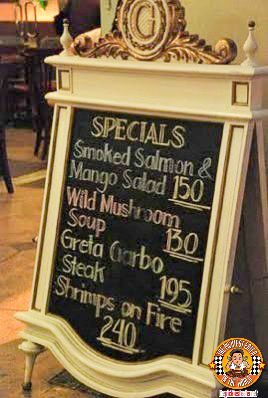 As I walked toward the door, It said in their "Specials" chalkboard "Greta Garbo Steak P195", giving credence to what my boss had said earlier. So thinking that the coast was clear, Rina and I headed off with my two friends through the doors of The Gustavian.. where we were in for quite a surprise. 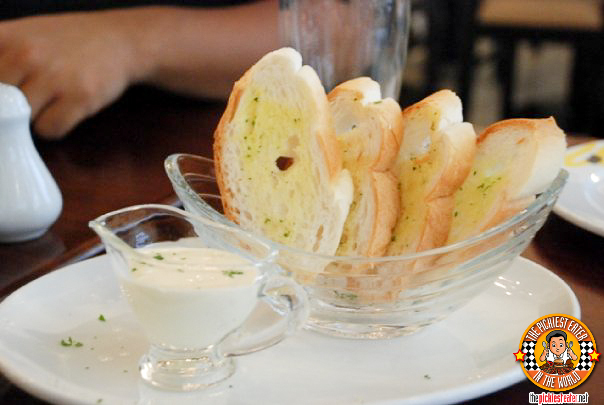 Let's call this, "Exhibit A"
Appetizers go from P370 to P620. Yep. Appetizers. So yeah, we didn't order appetizers. The soups were reasonably priced (P230), only because you could get them at half order (P130), which actually translates to "Normal sized human being" order. Pastas go for around P320, While everything else would be around P490 and above. 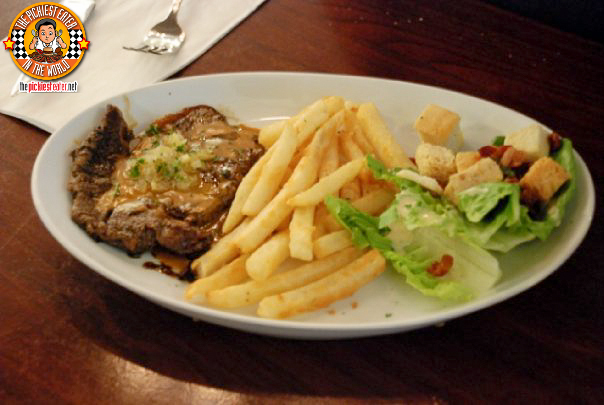 Steaks are priced at around P1,400 (not so bad compared to others), with choice of sidings and sauces. Four of these bad boys aren't enough for me. Good thing they refill. Actual photo from the wreckage found at Roswell, New Mexico, 1947. As the waiter came towards us from across the room, we saw the big bowl he was carrying. We thought he took down the wrong order, giving us a full bowl instead of just half. As he plopped the big bowl in front of us, we breathed a sigh of relief because it was evident that no mistake was made. This was a half order of soup in a bow so big, it should've had its own zip code. Anyone who watches any of the shows of Gordon Ramsey (Love them) knows that using big plates and bowls that you don't fill up with food just makes your portioning look tiny. I'll give it to them, the presentation does look nice though, but it really does give the impression of being too little. One taste of the soup though, and you won't care if they served it to you in a small garbage bag with a straw attached to it. 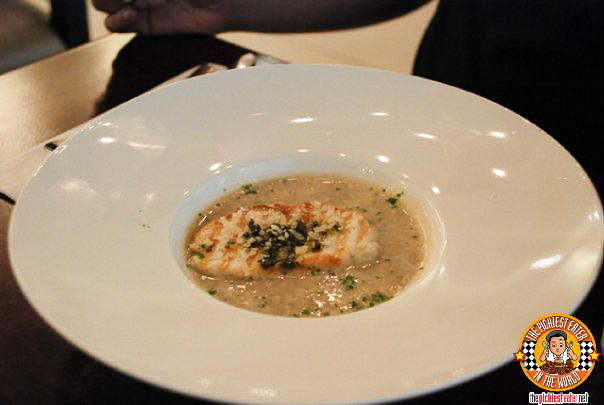 The soup was thick and creamy, and the pesto toast was a delicious added touch. The mushroom were finely chopped that I didn't really notice them, but it was packed with flavor nonetheless. 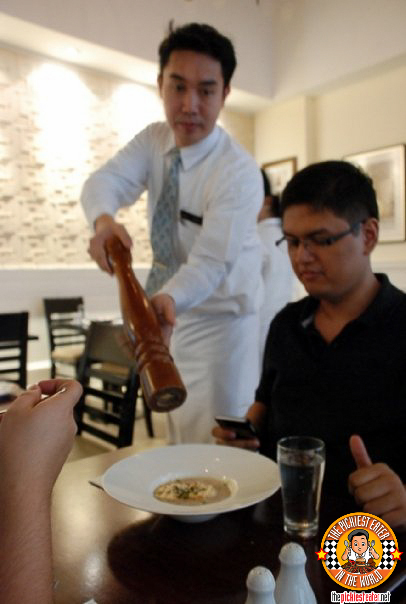 Mark actually didn't want pepper in his soup. He was just a bit nervous with that guy hanging around his back with that weirdly shaped stick pointed at him, so he eventually relented hoping the guy would go away. Good try, Gustavian. Not quite there yet, but a very good try. 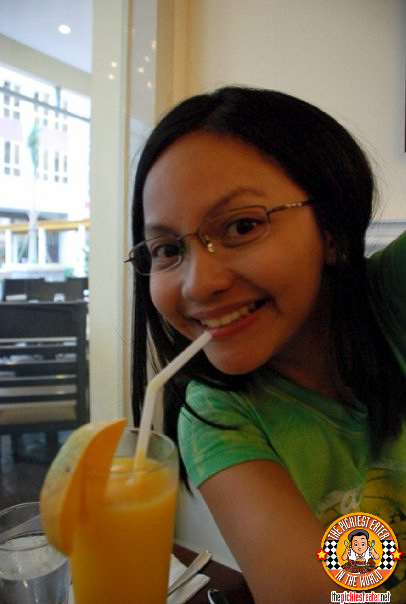 A few years back, one of my bosses went on a trip to Singapore. When he got back, he brought everyone these cool trinkets. Everyone except me. Of course, I didn't say anything, but since we were pretty close, I was wondering why I didn't get anything. While everyone was enjoying their cool souvenirs, he pulled me aside and said, "I know you don't like souvenir pins and snow globes, so I got you something else. I'll give it to you before I leave." It got me a little bit curious. I went with him to his car, and he handed me a moist and slightly bulky plastic bag. "Steam this for a few minutes. Add some cream and hot water to the sauce in the packet. Trust me. You're not going to forget this." Of course, I was happy I got food, but the plastic bag it was in, was a brand name I recognized, but not anything for food. 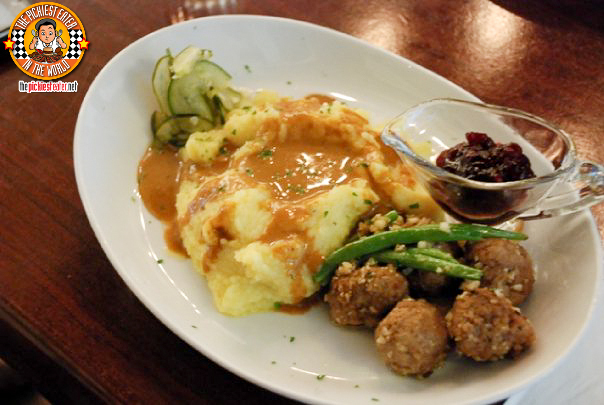 Going back to the "Gustavian" (sorry.. lost track for a minute), It was pretty much a no-brainer that when I saw "Swedish Meatballs" on the menu, I relieved the memories of one of the best things ever. So it was the only thing I could think of ordering (like my buddy, Ted). The Gustavian's version was quite good, but at the end of the day, it didn't measure up to the high standard of Ikea's. The meatballs are a bit small, but their deceivingly filling. Maybe the generous portioning of mashed potatoes adds to that. Also, they added a cranberry jam to it, in an attempt to get it closer to an Ikea taste (Ikea uses lingonberry jam.. i don't know what lingonberry is by the way but im at the point where I don't actually care). Meat, potatoes and salad. Could've done without the salad. I don't know what was so Greta Garbo-ish about the steak, but it wasn't actually anything outstanding, although the gravy was an excellent complement to it. It was a very soft tenderloin steak that was grilled very well, but a bit to thin and lean for my liking. (No fatty, no likey). The best thing about the dish those were the french fries. I don't know how they cook it, but it's truly amazing. based on the texture, the fries are sprinkled with something.. I just can't put a finger around it. But my mouth, however, is a different story. Again, in another unfortunate case of not living up to the standards of a predecessor. Rina ordered their Grilled Salmon with Mushroom Pilaf because she loved the similar dish at the now defunct "F Word" restaurant along Palanca, (they used mushroom risotto), cooked up by my friend, Hatch. Again, this version was quite delicious on its own, but was a far cry from what Rina was hoping for. A creamy sauce with the potent taste of cheese to it, that coated the flavor of the fish just right. I feel that they should've used more sauce though. I have no idea why Mark's right hand is shaking vigorously like that. Despite the look on his face, I'd like to believe it was for no other reason that he was in the midst of doing a "thumbs up" sign. As a restaurant, I would go back to The Gustavian, but in all honesty, it's not in the list of my priorities at the moment. The food is pretty good, no doubt, but I'd be ok even if I didn't. The delicatessen section of The Gustavian though, actually does have a wide selection of Deli meats, cheeses and other European branded gourmet items that is definitely worth taking a look at.. Especially if you're a foodie or a chef. I am now so intrigued with Ikea's Swedish Meatballs! And that is what I have taken away from this blog post. Haha sorry Gustavian. 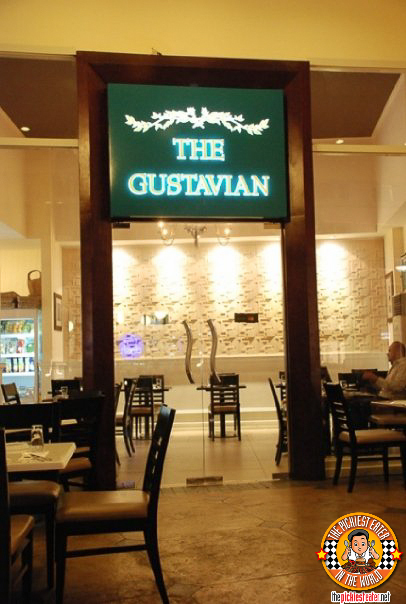 F Word transformed themselves into what is now Gustavian Steak Lounge.. They do have some of the best steaks you'll try in the metro, and their ala carte menu is pretty awesome as well.. they have an American chef that has worked around south east asia.. 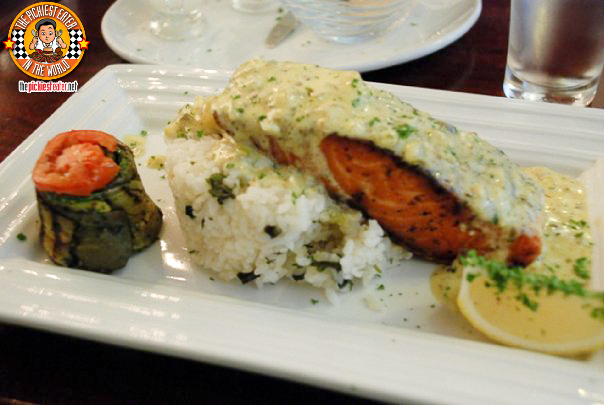 I still miss the Grilled Salmon with Mushroom Risotto F word though.. sniff.. They had other cool items too! Like their Squash Carbonara!